WHERE SHOULD THE BEST TIRES GO? Is it dangerous to put tires with the most tread on the front wheels? Yes - It has been researched and documented that tires with the most tread must go on the back of the vehicle to help maintain better control! The depth of tread on a tire directly impacts at what point a tire will begin to hydroplane. FACT: Tires on the front will typically wear more than tires on the rear of a vehicle. 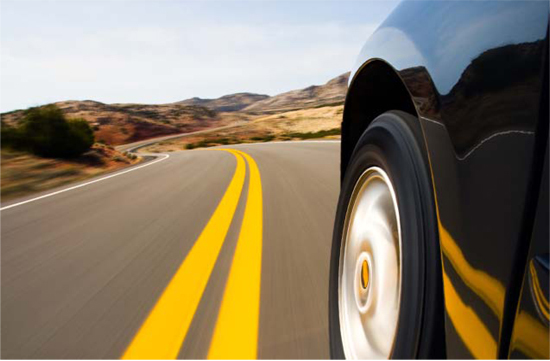 FACT: If the tires are rotated every 5,000 to 8,000 miles, the tires on the vehicle will have reasonably even tread. FACT: Many people don't rotate their tires every 5,000 to 8,000 miles. Thus, when they have their tires looked at, the front tires have worn out and the back tires still have some tread life left on them. It is thus necessary to only replace the front tires. FACT: If one pair of tires has more tread on them than the other pair, then the pair with less tread will begin to hydroplane with less water on the road surface than the other pair. FACT: If the pair of tires which begin to hydroplane first is on the front of the vehicle, it is far easier to regain control of the vehicle. First, the driver will feel the skid in the steering when the skid begins. Second, the intuitive action of taking your foot off the accelerator and steering into the direction of the skid will prevent loss of control. When it is the back tires which begin to skid, it is much more difficult to control. The loss of control is much harder to detect because it isn?t felt in the steering wheel and the actions to control are counterintuitive (turning away from the direction of the skid). Thus: Every tire manufacturer recommends that the new tires (or in a rotation situation) that the tires with the most tread be mounted on the rear. 1.Many tire professionals still believe that the tires with the most tread should go on the front if it is a front-wheel drive vehicle. 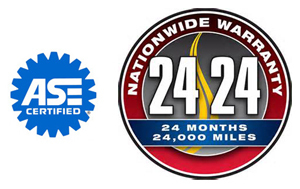 2.Many tire professionals believe that it makes a difference what season of the year it is. 3.Many tire professionals will ask the customer for his or her preference. "Where do you want us to put the new tires?" 4.Many tire professionals will simply rotate the more worn tires off the front of the vehicle to the back, even when the tires are not replaced. Prevention: Insist on putting your new tires on the rear. New Tires must go on the Back. Tire Placement Myths? Front Wheel Drive cars - This is a tricky situation, because it is natural to assume that the wheels that have to do the pulling (front wheel on front wheel drive car) should have the best traction. The natural assumption is the wrong one and the likely reason that the installation of two new tires is done wrong on so many front wheel drive cars. All Wheel Drive vehicles - The rule is the same. Best tires on the back. Snow Tires - The Rule is the most tread on the back. If you need snow tires in a front wheel drive, because those are the tires that do the pulling, then you must put snow tires on all four wheels. See manufacturers' recommendations below. It makes a difference what season - This is likely a corollary of the front wheel drive/snow tire myth. Since people are most concerned about traction in the winter snow conditions, the argument for wanting the best traction on the wheels doing the pulling seems strongest. Yet, the front wheels slipping, even if it is the tires doing the pulling, are far less dangerous than losing control of the back end of a car. This is the reason that all tire manufacturers, say "best tires on the back." If you need better traction on the pulling tires, then get four new tires. The blow out risk - Of course you'd rather have a blowout on the back as opposed to the front, but if you are going to have a blowout at highway speeds, the tread depth is not going to be the cause. It will be caused by something like a nail, a pot hole or other foreign object or hazard. If a nail goes into the tire, it doesn't matter if you have 4/32 or 14/32 of tread depth. Further which is a greater likelihood of happening? A blowout or driving in rain on the interstate? Definitions: Oversteer - Oversteer (losing control of the rear wheels outside the path of travel) Understeer (losing control of the front wheels). Tire Manufacturers' Recommendations. What the Manufacturers Say. Goodyear: www.goodyeartires.com "When you select a pair of replacement tires in the same size and construction as those on the car, we recommend you put them on the rear axle." Bridgestone/Firestone: www.tiresafety.com from the Replacement Manual: "Winter tires are best applied to all vehicle positions. If winter tires are applied to the front axle of any vehicle, they must also be installed on the rear. Do not apply winter tires to only the front axle --- this applies to all passenger cars and light trucks, including front wheel drive, 4x4 and all-wheel drive vehicles." Dunlap: www.dunloptires.com "When you select a pair of replacement tires in the same size and construction as those on the car, we recommend you put them on the rear axle." Michelin: www.michelinman.com "A pair of new tires should go in back. See video." BF Goodrich: www.bfgoodrichtires.com "REPLACEMENT OF TWO (2) TIRES It is recommended that all four (4) tires are replaced at the same time. However, whenever only two tires are replaced, the new ones should be put on the rear. The new tires, with deeper tread, may provide better grip and water evacuation in wet driving conditions." Continental: continentaltire.custhelp.com "Winter tires should be used on all four wheel positions. Never put non-radial winter tires on the rear if radials are on the front, except when the vehicle has duals on the rear. On front-wheel-drive or performance vehicles, it may be advisable to install winter or all season tires on all wheel positions to maintain consistent handling in winter conditions." Tires should be serviced periodically following the rotation patterns provided in the vehicle's owner's manual or as established by the industry to help enhance wear quality and equalize front-to-rear and side-to-side wear rates. The minor differences in tread depth between tires that might be encountered immediately after periodic tire rotations at 5,000-7,500 mile intervals won?t upset the vehicle's hydroplaning balance and should not preclude rotating tires. For that matter, any differences in wear rates actually indicate that tire rotations should be done more frequently. Ideally tires should be replaced in complete sets. However when tires are replaced in pairs, the new pair of tires (assuming the vehicle is equipped with the same size tires all of the way around) should always be installed on the rear axle and the existing partially worn tires moved to the front axle. While insufficient tire rotation intervals and/or out-of-adjustment wheel alignment angles often caused the differences in front-to-rear and side-to-side tire wear rates in the first place, the need to keep deeper treaded tires on the rear axle to resist oversteer conditions caused by wet road hydroplaning is important. Unfortunately this precludes the future possibility of ever rotating tires. Once a pair of tires has been installed, the only way to escape being forced to drive on mismatched tires continually is to install a complete set of new tires (especially on front-wheel drive vehicles).